They will probably have their Christian Rock Festival sometime this summer but shows during summer have always been limited compared to the rest of the season. I look forward to seeing you on the park. Looks like I’ll be signing up then. By any chance are hosts allowed to attend? 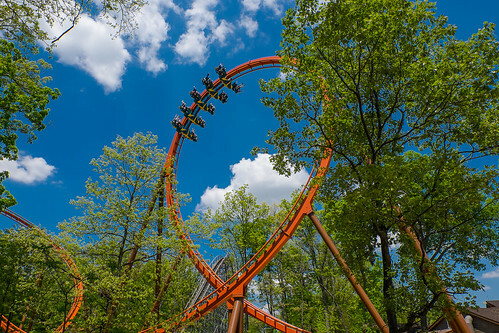 ^How would that work with the normal 50% off admission for having a SDC season pass? I too might be interested. sdcfan88 wrote: ^How would that work with the normal 50% off admission for having a SDC season pass? I too might be interested. Call to be sure, but expect it'd be full price ($85). The discount for DW pass holders isn't much so I doubt other discounts would apply. I visited the park this past Friday for the first time in 16 years. I freaking love this place! I thought Wild Eagle was great and don't understand how a lot of people call it forceless. Firechaser is just pure fun! Mystery Mine is a bit rough, but man that coaster is cool lol! Thunderhead was a bit rough, but had a lot of airtime! I liked it! Although it did feel like that lap bar was trying to rip out my belly button ring lol! Lighting Rod......OH MY FREAKING GOD! How was that even possible?! Videos do not do this thing justice! It is SO fast and intense! I wish I lived closer to the park simply for Lighting Rod! The only negative thing I have to say is I wish they could fix that pot hole at the bottom of the first drop. That part hurts lol! Hmm, I was there earlier this week and never noticed the pot hole.. it was a lot worse and they smoothed it out.. I guess bc it's not as bad as it used to be, I don't even notice it anymore haha. As far as the pothole on LR, I felt it on my first ride back in Nov. of ‘16 but haven’t “felt felt” it since. Although I do know if you ride more towards the back you’ll feel somewhat of a “slam” down when you get to the bottom of the drop. I think it’s like the last 2 or 3 cars you’ll feel it. Simply because you’re floating down the drop on the upstops at high speeds then once you start to crest you touch back down. Unless the track does need smoothing out again in that area. I haven’t gotten down to the park this year yet, fingers crossed this weekend. Isn't there a bridged section of supports at bottom of the drop for some type of maintenance road? If you only feel the "pothole" in the last 2 or 3 cars, I would almost bet that it really isn't a pothole, but more of the track flexing on that bridged section when the train starts to go over it. That's the fastest part of ride with probably some of the stronger positive forces on that ride. So that section probably isn't as strong as it would be if it was supported all the way to the ground.